We asked, you answered: How do you give? 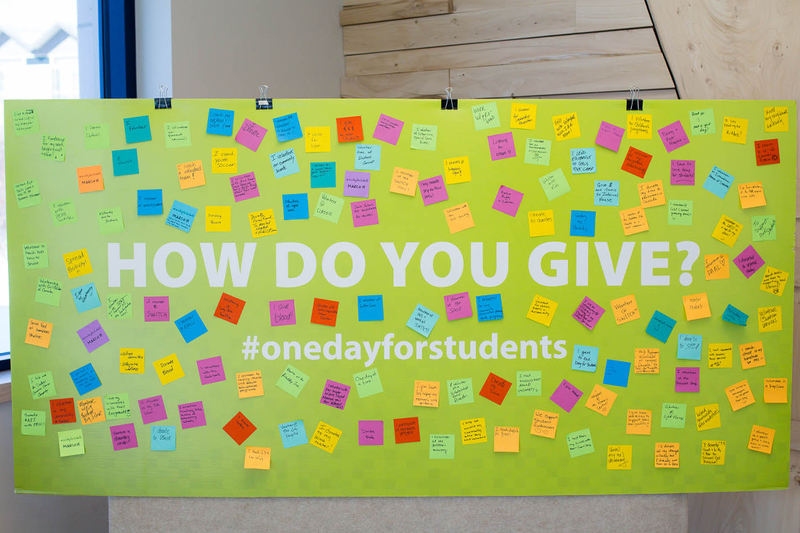 On One Day for Students, we asked “how do you give?” and the U of S community showed us. Students, alumni, and the campus community came together on March 14 in support of students facing financial crisis, raising $46,436 for the Nasser Family Emergency Student Trust. Professor Emeritus Dr. Kay and Mrs. Dora Nasser, U of S alumni and philanthropists, matched all donations to the Nasser Family Emergency Student Trust, and were so inspired that they also matched the additional $5,345 donated to other U of S priorities on One Day for Students, bringing the total raised to $103,695 from over 500 donors. The tremendous support of the Nasser Family Emergency Student Trust means more students will have peace of mind, knowing there is a community willing to help them through an unexpected financial hardship so they can focus on their studies. 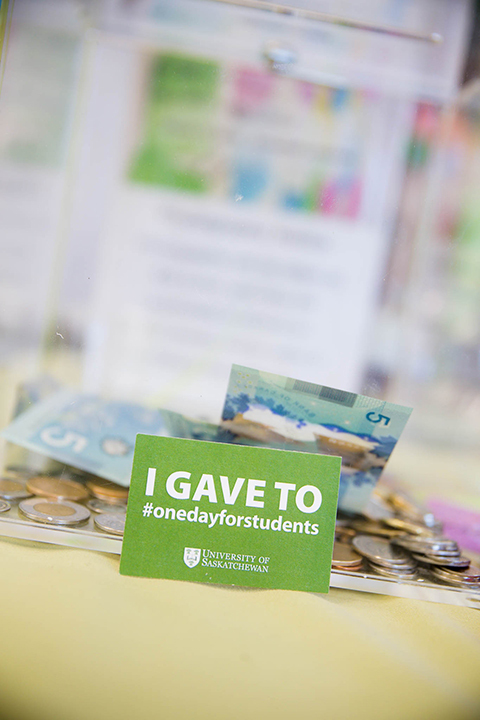 Donation booths were also set up in six locations across campus on March 14. Passerby were encouraged to donate a dollar (redeemable for a free coffee, donated by Road Coffee) and write how they give back to their community on a sticky note. At day’s end, more than 200 donors contributed to the colourful art installation. The Nassers were on campus for a special luncheon with student leaders. They later attended a talk by Shaina Lynden (BScKin’05), a kinesiology graduate and officer with the Saskatoon Police Service. Lynden’s passion for people and community involvement led to her co-founding Ryde YXE Cycle Studio in 2016, which has quickly established itself as a community hub. The studio partners with local non-profits and community organizations and gives back through its weekly charity class, Ryde for Change. Lynden speaks in her keynote address. 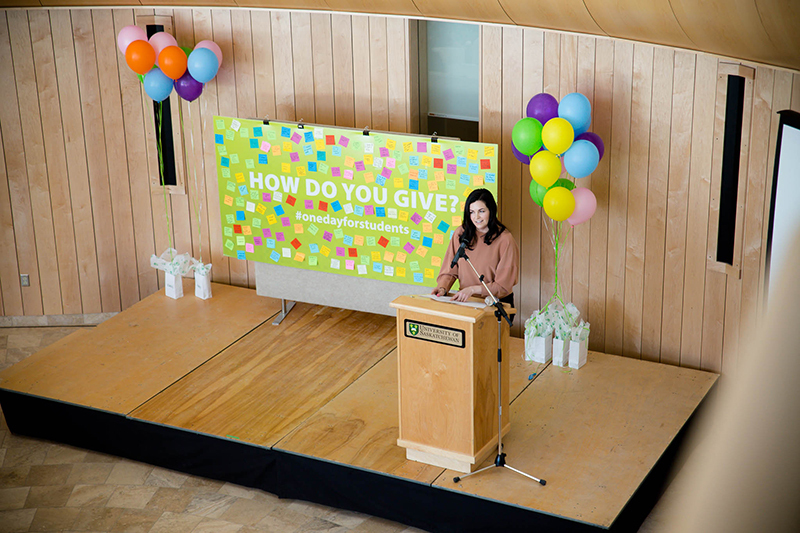 In her address, Lynden talked about her journey through philanthropy and giving back to the community. She also maintained that there is more to it than just giving money—time and talent play a large role as well. “I began by identifying those needs that I saw around me, and I started taking inventory of the assets that I had in order to bridge the gap,” she said. By giving to the Nasser Family Emergency Student Trust, donors are ensuring that students can continue to excel at university and contribute to their communities, just as Lynden and the Nassers have done. Article re-posted on 2-Apr-2019 4:32:39 PM .